The red chili burst with lemon juice in the cucumber give a fresh taste in this Salsa/Salad. You can also add tomato, red onion, coriander leaves if you want. Try this recipe at home. 1. Cut the cucumber into small dice. 2. 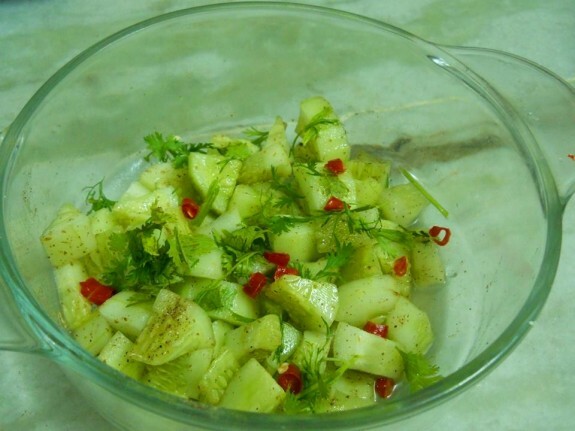 In a medium bowl, mix the cucumber, chat masala, black salt, chopped red and green chillies and 3-4 drops of lemon. You can add chopped coriander leaves and mix it well. 3. Cucumber Chlli Salsa is ready to serve.